I am literally obsessed with my creative friends. 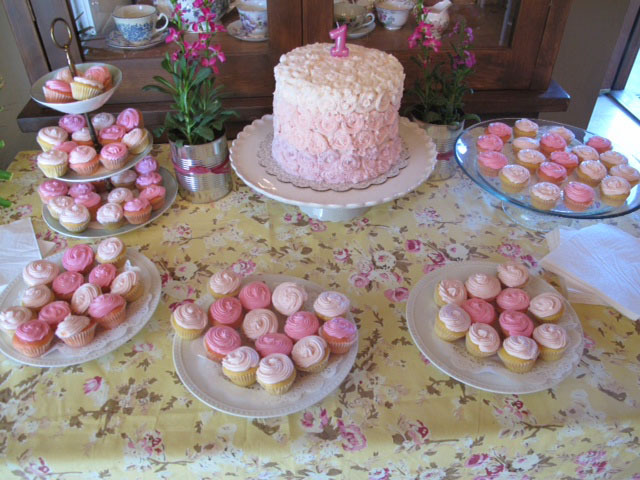 Our friends Michelle & Bryan threw their sweet little girl Eloise the most darling 1st birthday party last weekend. I am kicking myself for not bringing my camera but thank goodness Michelle takes pretty pictures! I’m totally blown away by this darlingly (is that a word?) elegant party. Makes me pray for a girl! But also the fact that she did all of this on a tiny budget makes everything even more amazing. Please note, I had absolutely NOTHING to do with this adorable party. But I begged her to share the details and she gladly obliged! I’m totally amazed by the amount of DIY they did… They turned that 29 cent wood fan from Michael’s (on the left up there) into chalkboards… AND she MADE the paint herself using a recipe she found on pinterest. Seriously!? That’s true elbow grease! 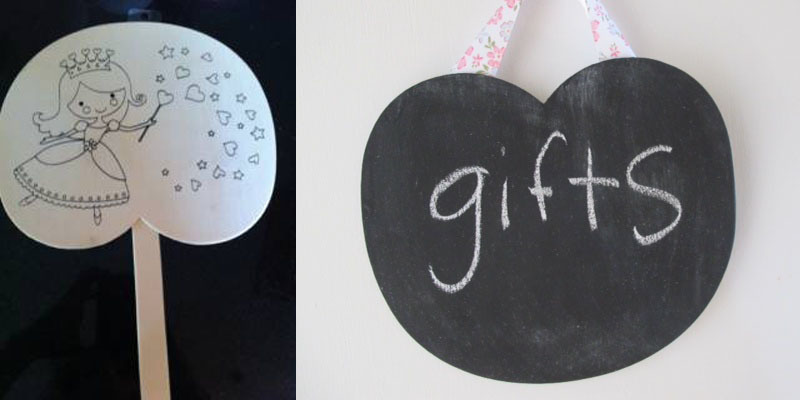 Just turn upside down, add ribbon, and look how cute they turned out! The tents were my (and my boys’) favorite part of the party. They set up a toddler-friendly activity in each one and my boys were in total heaven! She got the idea for them on pinterest and they MADE them themselves. (See? DIY King and Queen right here!) They looked like they were professional – they should sell these suckers in my humble opinion! They got the sheets from Macy’s ($10 for a set, a fitted sheet, flat sheet and one pillow case) and her sister used the extra fabric to make pillows placed all around the party. In case you’re going to knock this party off, (and why wouldn’t you?) the activites they set up were a book station, a bubble station (check out the mason jar bubble holder Eloise’s grandpa made! 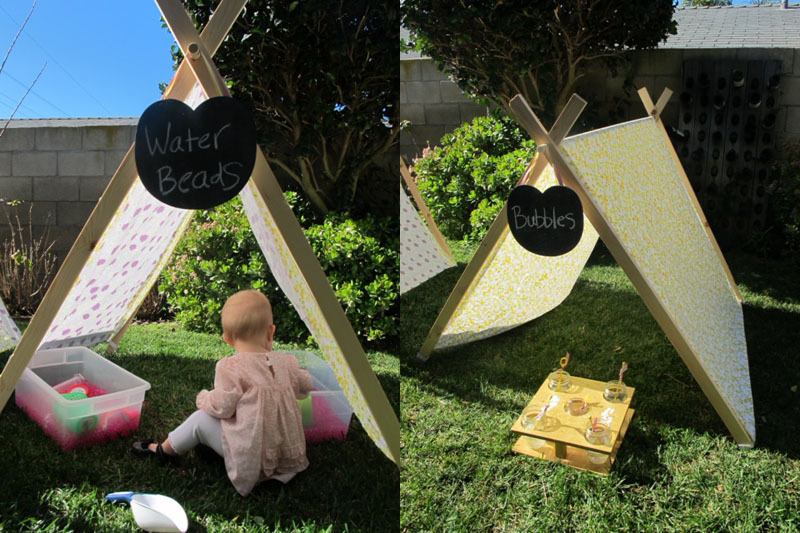 ), a water bead station (bought from the floral section at Micheal’s and SO fun for kids!) and a chalkboard station. Not sure how well this shows it off, but they hung doilies from twine and hung them all over the house and outside. It was so dear and vintage chic! The doilies were $2 a pack at Walmart and the twine $1 at the Dollar Tree. What an impact for such pennies! And they looked so cute outside as well! 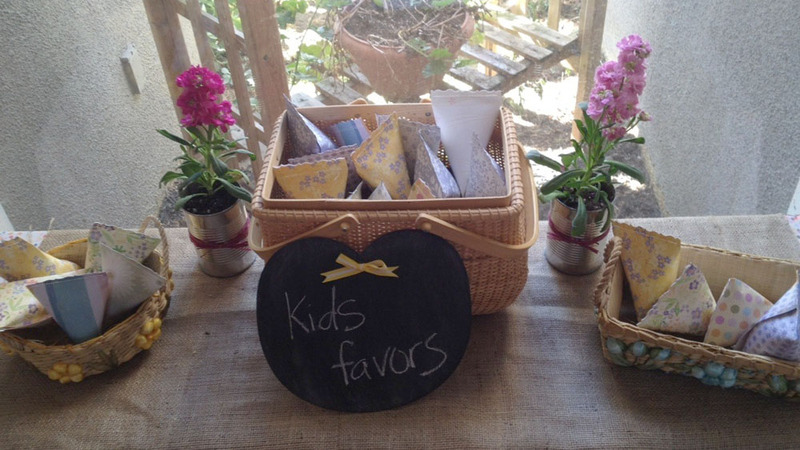 The favors were another pinterest idea. She used scrapbook paper from Micheal’s, then sewed them together. They were so cool and were twisted which made them even more darling. I love how she used burlap as tablecloths, tin cans as vases, and vintage looking baskets as display cases. The above photo obviously does not do it justice, but they crafted Eloise’s name out of leafed branches. This was hanging right over the favor table and was such a sweet detail – I wish you could have seen how great it looked in person! The napkin holders yet again another pinterest idea. 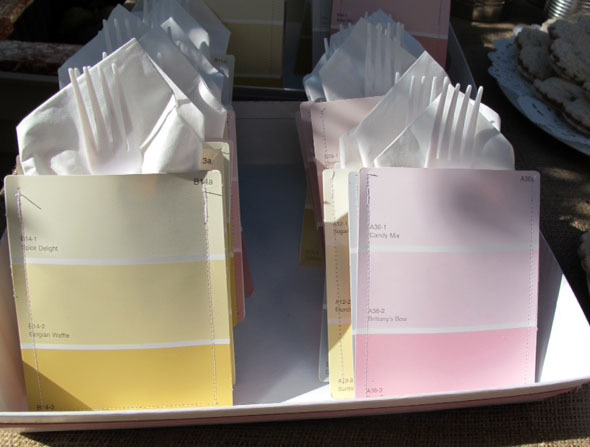 She “got” the paint sample cards at Lowes and then sewed those together. Not pictured was all the cute food outside too. This always blows my mind as I am so not good at that stuff, but they made sandwiches for the kids in the shape of a heart and the edges were pinched together. Too cute to eat, I swear! And if your mouth is drooling at the sight at that table above, you’re glad you weren’t there to taste this stuff or you would have gained about 400 pounds. I think I ate a whole plate of cupcakes… they had edible glitter on them and I kid you not, they were THE BEST things I have ever had in my mouth. EVER! Michelle, her mom and sister whipped up these treats and it truly looks like they went to the best cake shop west of the Mississippi. 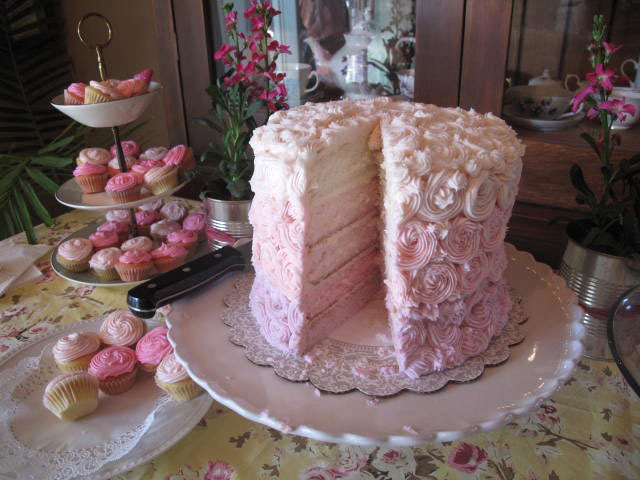 Even the inside of this adorable cake was beautiful! Look at the detail! I am in such awe on the food end of things. This truly blows my noodle! So that does it. 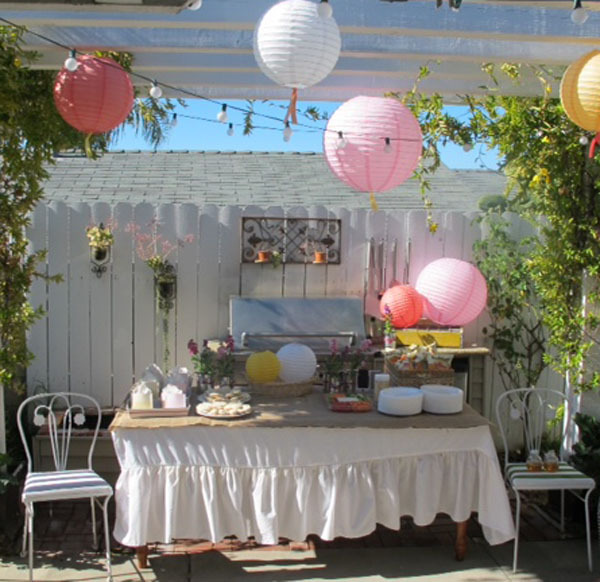 I really need this new baby of ours to be a girl… I’ve got to have a party like this in my life! Thanks so much Michelle, Bryan and Eloise for sharing such a charming little birthday party. I adored every single detail. 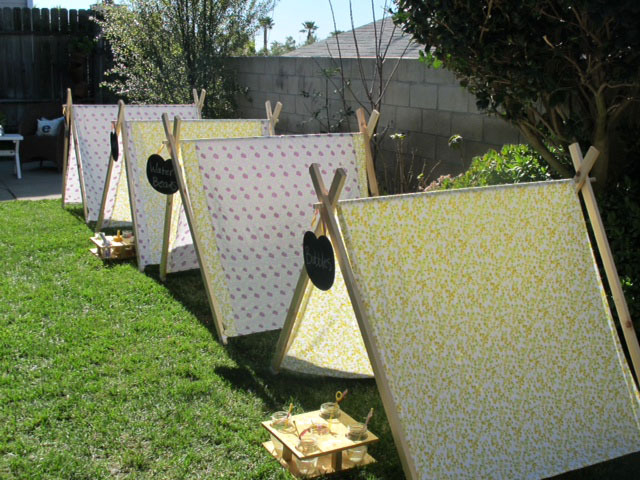 This entry was posted in kid's parties, parties for kiddos and tagged 1st birthday party, activites for birthday party, diy birthday party, diy teepee, diy tents, doily banner diy, girl baby shower, girl's birthday party, girly birthday party, pink cake, rainbow cake, vintage girly party, vintage tea party by Annika. Bookmark the permalink.